LOS GATOS, Calif. — Netflix Inc.'s Internet video streaming service will be the only place to watch an upcoming TV series with a high-powered pedigree that includes Academy Award-winning actor Kevin Spacey and the director of an Oscar-nominated film about Facebook. The deal announced Friday illustrates Netflix's growing clout in Hollywood as its mines revenue from its 20 million subscribers to create new home entertainment options. In this instance, Netflix will be showing a series that won't have a scheduled broadcast time. Episodes could be released in bunches instead of just one per week. "It's a show people will be able to discover over time," Ted Sarandos, Netflix's chief content officer, said in a Friday interview. "It doesn't have to happen over the first week, first month or even the first year of the show." Netflix didn't disclose how much it is paying Media Rights Capital, the studio behind "House of Cards." The agreement covers 26 hour-long episodes, an usually large commitment for a series that hasn't even entered production. The series will debut on Netflix late next year. The high-profile names connected to "House of Cards" made it a hot commodity. Besides featuring Spacey in his first regular role in a TV series, the pilot will be directed by David Fincher, a respected filmmaker nominated for a best-director Oscar for "The Social Network," a movie based on the legal battle pitting Facebook founder Mark Zuckerberg against his former friends and classmates at Harvard University. "House of Cards" is based on a novel about British politics during the 20-year regime of former Prime Minister Margaret Thatcher. This will mark the first time that Netflix owns the exclusive rights to an episodic series, an advantage that has worked well for pay-TV channels such as Time Warner Inc.'s HBO and CBS Inc.'s Showtime. HBO, with an estimated 28 million U.S. subscribers, has steadfastly refused to license critically acclaimed series such as "The Sopranos" and "The Wire" to Netflix's streaming service because of their intensifying rivalry. In landing the rights to "House of Cards," Netflix demonstrated it has the financial muscle to outbid the more-established pay-TV channels. "It was probably the most sought after premium series on the market now," Sarandos boasted. They chose an odd time to do this, as AT&T is going to cap the amount of bandwidth per month and many other ISPs are expected to follow suit. Many believe this is being done to go after Netflix. I am dying for Season 2. I watched the first season once in a frenetic binge like no other, then watched again over about a three week period with my husband. I cannot wait! Also, Amazon released this on DVD. Meanwhile, casting rumors have also been circulating for the new season. ; Molly Parker from "Deadwood" and Sam Page, Joan's ex on "Mad [People]" have been rumored to join the cast. Other new cast members include Jimi Simpson and Kate Lyn Sheil, who is set to play a 'secret' character. Awesome speech by Kevin Spacey about HOC at the Edinburg International Television festival, about why they went to Netflix instead of producing a "pilot" for the networks. This is why HOC is the most exciting new production in this relatively new platform and a clear indication of why scripted drama will continue to expand on digital distribution and continue to decline on network television. It's only a matter of time. This new trailer is amazing. I cannot wait. I really need to watch the first season. Dammit. Two episodes left in Season 1. Absolutely loving it. Great plotting, sets, cinematography, directing, wonderful performances. A stunning show. I binge watched this show over the summer, absolutely loved it! I'm on my third viewing. Still loving it. A lot of viewers had a problem with Frank's monologues directed at the audience, but I thought it was very Shakespearian. I cannot wait for the new season. So happy there are others who are enjoying it. 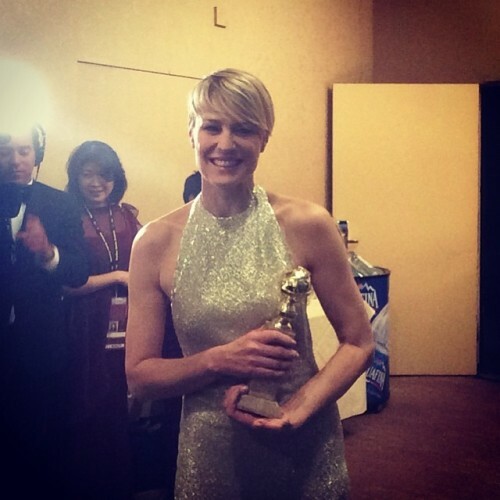 Robin Wright won a Golden Globe for her performance. 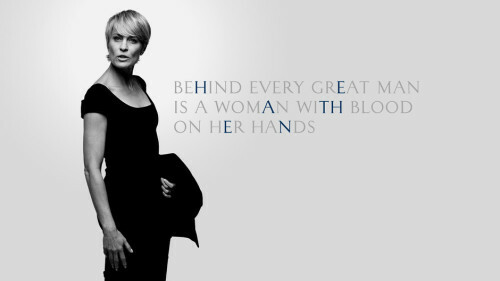 House of Card S2 review. Hmmmm. Is this a new character? Thank you all for the articles and reviews.